The face-lifted Mercedes-Benz E-Class takes on the striking Jaguar XF. So, which one comes out trumps in this battle of Germany versus Britain? Once again, in the turnstile of history, we stand at the critical juncture – a war is brewing between Germany and Britain, and a lot is at stake. Thankfully, though, this war is more like a small battle being played out in the ultra-competitive sector of the Indian luxury market. But, yes, there is a lot at stake here! 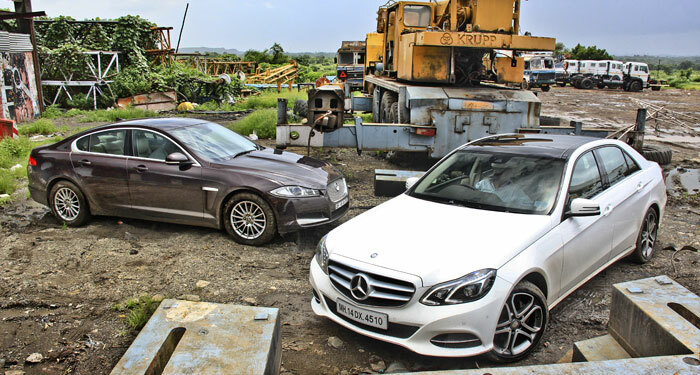 The stakes are high for one simple reason – both the E Class and the XF are the highest selling products for both manufacturers in India. Despite both having a range of products that sell fairly well, these luxury sedans are the bread-and-butter models – the ones that make the numbers tick. So, with the E Class receiving a major upgrade, it was time to put it against one of the cars in this segment that we’re personally quite fond of to see where things stand. Now, as far as looks are concerned, I think the new E is a far better looking automobile than the preceding version. The chiselled and angular face of the older car never really cut much ice with me, and I think the new, bolder face combined with the standard fit LED headlamps suits its character much better. Combined with the revised rear, with its LED tail lamps, it looks like a far more cohesive design – and much more imposing too. The Jaguar, on the other hand, maintains its curvatious design – and the front-end looks rather striking, with a look that’s inspired by the bigger XJ. However, the wheels fitted to the 2.2 litre version look rather small and ungainly. Despite being a decent 17-inch size, they appear smaller than that, and make the car look rather frumpy. To be honest, it makes the good-looking XF suddenly seem rather plain, and to anyone seriously considering buying the car I would certainly recommend a change of wheels to another style, if not to an 18-inch one. The E, predictably, has also received interior upgrades, which are further amplified with the equipment count in this ‘Launch’ version that we’re testing. Limited to 100 units, the Launch version boasts of additional goodies, such as Nappa leather upholstery, along with the 18-inch wheels and a panoramic sunroof. However, it’s fairly evident that rather than make radical changes to the interior design, Mercedes has focused on improving the materials and trim levels of this car. So, the interior plastics and other surfaces now feel superior, and the general fit-and-finish is better than before. What also helps the Merc’s interiors is the panoramic sunroof on the Launch edition – allowing far more light into the cabin, and making it feel bigger and more airy. The Jag’s cabin, on the other hand, is now beginning to show its age. Having been designed in 2008, with minor improvements made to it during the 2011 facelift, the cabin’s surfaces and design now seem like they need an upgrade. The finishing seems a tad iffy compared to the E class, and, of course, the equipment count is also lower on the Jag. However, the bigger issue is the lack of space in the XF. The rear seat, particularly, has less legroom than the E, and the sloping roofline reduces headroom to an extent. This, combined with the smaller sunroof, doesn’t do the interior any favours. But the biggest problem is Jaguar’s out-dated infotainment system. Unfortunately, while rivals have moved on to newer systems with innovative control techniques (iDrive, MMI), Jag is stuck with a touchscreen that is simply too slow and cumbersome to use. If there’s one aspect of the XF, or Jaguar’s in general, that urgently needs attention then it’s the infotainment system. So, as far as the interiors go, the E class has a definite edge over the XF. It feels better put together and more premium, while also offering more space and additional equipment. But, out on the road, the XF pulls its own back – and very quickly too. Despite boasting only 188bhp, the 2.2 has sufficient grunt to propel the XF down the road in a spirited manner. What makes the task easier is the 8-speed automatic transmission fitted as standard to the XF, which offers brilliant shift quality and excellent manual control via the steering mounted paddles. Combine this with the excellent ride-and-handling setup, and the XF is a deeply impressive car to pilot around – both in the city and on the highways. The ride is pretty composed (those big sidewalled 17-inch tyres play a significant role here), and the steering, along with the brakes, inspires absolute confidence in the machine. The E 250 CDI, on the other hand, boasts of more power and torque over the XF 2.2 (201bhp vs 188, and 500Nm vs 450), and is a perfectly capable machine to tackle our conditions. However, it is outclassed when it comes to driving appeal – mainly by the 8-speed gearbox in the Jag. In comparison, the Merc’s 7-speed 7G-Tronic transmission is slow, reluctant to shift down even when using the shift paddles, and just doesn’t respond as seamlessly or quickly as the Jag’s gearbox. Mind you, with that abundant torque, the E is never caught out of breath at any speed or in any gear – but it just doesn’t feel as involving to drive because of the slow-witted gearbox. At the same time, the E’s steering seems a bit remote and not really full of feedback, adding to the numbness of the driving experience. When it comes to on-road manners, both the cars offer excellent ride quality, which was evident given the pock marked state of the roads in the middle of the monsoon season. The E’s ride is a bit hampered by sharp bumps, but that seems mainly due to the 18-inch wheels fitted to the Launch edition – it should be markedly improved in the regular version with 17-inch wheels. The Jag, of course, offers excellent balance – and it seems, in this respect, neither car has an edge over the other. The choice, then, is clear – the Jaguar is clearly the driver’s car out of the two. Not only does the XF respond faster to the driver’s commands – with a majority of the credit going to the excellent gearbox – it just feels more cohesive and communicative on the road. But, in this segment, the majority of buyers are largely chauffeured – and, in that aspect, the E Class does trump the Jag. Not only does it offer more room inside, but with the improved interiors and inspired looks, it seems to offer a better package to the consumer who will spend more time travelling in the car rather than driving it. Of course, the higher levels of standard equipment do play a role in the final equation too. Let’s put it this way, someone like me would prefer the Jag. It’s a superior driving machine, but, then again, most consumers actually spending their hard-earned money don’t think of one aspect alone. And, in the overall aspect, with superior room, improved interiors, and better looks, the E is a better overall package.